How will this building improve its community? Every facet of our development process is structured around the local community. From initial planning meetings to ribbon cutting ceremonies, Karsten approaches development in a personal manner. By focusing on communities and building relationships throughout the development process, Karsten has become a development leader throughout the northeast. Our latest development, Copper Cove Village, is a forty-two unit apartment complex that towers over Plymouth Harbor and offers sweeping views of Plymouth Bay. Units will be available in 2017. The project also includes an affordability component through the Massachusetts' Local Initiative Program. Karsten renovated three buildings into fifteen condominiums and oversaw the entire project, including planning, design and construction. This three year re-development was the first successful 40R project in Massachusetts. The Karsten Company worked with local and state officials to meet state guidelines for the development program. 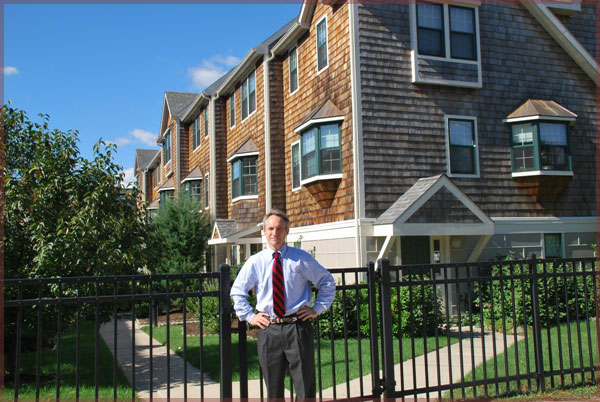 Karsten oversaw the construction of ten new twenty-two hundred square foot luxury townhouses in the heart of Wollaston. As development managers, Karsten coordinated with the local parish, town officials and the surrounding community to construct new townhouses that fit into the existing neighborhood and helped the local church group. Want to learn more about our development process? Click here to contact us.